Asian jumping lice and a bacteria called C. liberibacter which the lice carry have been devastating Florida’s Orange crops since 2005, but scientists have found a solution! But do we really want to consume orange juice that contains genetically modified DNA, via pig genes? That’s an actual question consumers will need to ask themselves in light of a recent article in the New York Times piece, “A Race to Save the Orange by Altering its DNA”. The jumping lice disease leaves oranges half green and tasting sour, but that citric bitterness might be more than disagreeable if we start eating GMO oranges tainted with pig genes. Tons of pesticides were sprayed to try to keep this bacteria in check, but as the world has observed with multiple studies exposing the over-use of pesticides, this often makes the problem worse. Instead of creating produce that is pest resistant, it is ravaged by superbugs created by a special bacteria in their guts which makes them impervious to the onslaught of Big Ag and Big Pharma chemicals. We also know that GMO crops are already causing cancer, Spina Bifida via a fungal toxin created by Bt toxins in Round Up, and numerous other birth defects, do we really need to be adding pig genes to our citrus crops? According to Ricke Kress, the president of Southern Gardens Citrus and the man in charge of two and a half million orange trees and a factory that squeezes juice for Tropicana and Florida’s Best, we do. He is willing to use any means necessary to maintain orange crops – even if it means resorting to questionable GMO practices that are already turning up in peer-reviewed scientific articles which ask farmers and Big Ag to consider the long-term ramifications of altering with our food supply. Among the contenders in the genetic alteration of the oranges are two vegetables, a virus and pig genes, as well as a synthetic gene, which would be manufactured in a laboratory. If these ‘solutions’ gain regulatory approval in as little as two years the public could be consuming pig-gene orange juice. The C. liberibacter bacteria has already cost Florida growers more than $4.5 billion, but they are also one of the largest mono-cropping areas in the country, which requires millions of pounds of pesticides currently to grow any oranges at all. 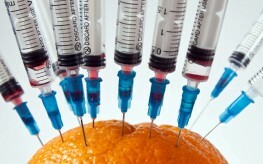 In fact, even the FDA admits that the orange juice we drink now is laced with pesticides. 9 out 14 samples come back from the lab with high levels of pesticides and fungicides like carbendazim, and others. It has become clear that Big Ag and the Monsanto monopoly on our food supply is not sustainable. The problem is getting worse, not better. Meanwhile organizations like the University of California Cooperative Extension were teaching the world about organic practices like pruning, non-pesticide pest management, irrigation and frost protection, cover cropping and ideal harvest to increase yield for Valencia oranges since the late 1990s. No pig genes are required. No vegetarians or vegans will buy this fruit if it contains pig genes but it doesn’t , the article on the New York times said they visited it for a short time but then went on to say that human intervention in plants has been ongoing for millenia and to that I say yes but that was through natural breeding of plants not from having a gene forced into another specie from another specie . Someone said the muslims and jews won’t buy this fruit either if it has pig genes in it , I have to tell you the Hindu population wont either . I will not drink or eat an Orange that is GMO period . Those folks just don’t seem to get it , that no one wants their contaminated food . period . Yes, the vegetarians, Jews and Muslims will still consume it. Why? Because these products won't be labeled as containing pig-genes. The FDA will never get behind any labeling effort. We're going to have to either go door-to-door to inform people, pressure grocers or label things ourselves. Until then, expect most people to do what most people have been doing. That is, consume the Frankenfoods. Keep your orange juice then. I won't drink it and neither will all the world's Jews and Muslims. What kind of world are we living in? What next? Right now I seem to have more questions than answers. Do the oranges that you can buy now contain pig genes? Unless labeled as Non-GMO, expect there to be some funny business going on. Monsanto needs to be stopped. They are destroying every food source we have, not to mention the soil, air, and water. Farmers use more roundup and pesticides than ever before. None of this GMO crap is good for us. We don't want it! Ca is finding natural ways to control insects and crops, why can't others?! It's not nice to mess with Mother Nature and what God made. This would be a much better world without all these evil chemical companies. Stop geoengineering chemtrails too, we have no organics anymore when they destroy the air, soil, and water and the health of every living thing!